In the land of celebville, oodles of its A-lister citizens publicly shun cosmetic surgery, claiming that they never have – nor ever will – go under the knife or syringe (as we are told they would rather age gracefully). Then we have those rare few who openly admit to having some ‘work’ done – but have now either stopped undergoing procedures, or having their cosmetic treatments removed altogether in a bid to look more like their natural selves. Now, this may be what they outwardly say, but in actuality, there is very little truth behind it. Take Kylie Jenner for example: she recently shocked her Instagram followers when she revealed she had all of her lip filler removed. When fans asked her about her new look on the latest photo she posted, she replied “I got rid of all my fillers” with worried face emojis. 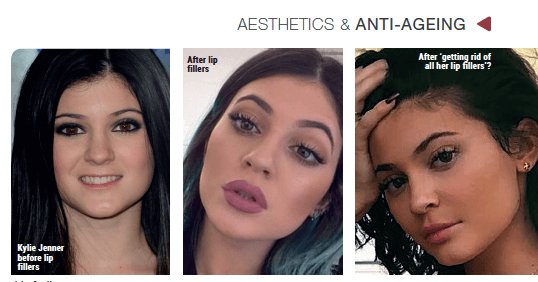 However, one doesn’t exactly need a magnifying glass to see the difference between these three images, particularly the before and after lip fillers shot. In addition, Kylie’s new sans-filler pucker is still noticeably fuller than her original pout – even after having them removed. So, not so sure about her claim on getting rid of ALL of her fillers, maybe some, but not all. It’s quite obvious that more permanent procedures are not so easily reversible to its previous state, but yes, we can have breast implants removed, though not the scar. 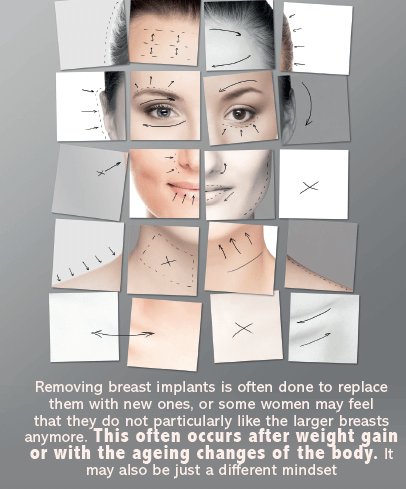 Removing breast implants is often done to replace them with new ones, or some women may feel that they do not particularly like the larger breasts anymore. This often occurs after weight gain or with the ageing changes of the body. It may also be just a different mindset. Whatever the case may be, it’s impossible to honestly advise on the benefits and risks of reversing this procedure, because every person is different. This will depend on your skin type, the type of previous surgery, the previous implant and technique, your soft tissue and numerous other factors that may or may not make you a good candidate for the procedure. A consultation with a plastic surgeon will provide you with the real answers – and not advice from another lady sitting next to you at the hairdresser, or your friend that had them removed. When it comes to injectables, there are certain fillers which are easily reversible, but you will have to know which filler type was used. Hyaluronic acid fillers for instance (which are the most commonly used by doctors) are very easily reversible, as an enzyme can dissolve it within 24 – 48 hours. Hyaluronic acid fillers are made from laboratory-produced hyaluronic acid (HA), which is similar to what we have naturally occuring in our skin, joints and eyes. In the laboratory they use a process called cross-linking of the molecules to make the fillers more suitable for specific uses, such as for superficial placement or deep placement. HA is a molecule that attracts water and keeps our skin, joint and eyes hydrated and lubricated. Therefore, these types of fillers are rather safe and natural, especially because unwanted placement can be reversed with the enzyme called hyaluronidase. Other types of fillers (non-hyaluronic acid fillers) are more difficult to reverse, and is quite a complex procedure. When do we need to reverse fillers? Hyaluronic acid fillers are most commonly dissolved or reversed when it is placed in an incorrect position (and rarely because somebody does not like the effect). Often the fillers are injected too much or too superficial under the eyes to treat dark circles, or what is referred to as the tear trough. The tear trough is a very delicate area directly underneath the eyes that forms a shadow in this depression. Many women become obsessed with removing this and insist on having this area filled up, which is not as simple as it may seem. Because of the delicate nature of this region, fillers may cause lumpiness, puffiness or become visible through the thin skin underneath the eyes. The filler may even appear blue in this area, although the hyaluronic acid filler is actually transparent or clear. The reason for the blue colour is because of a physics phenomenon called the Tyndall effect that is due to the scattering of light in colloid. This is similar to the Rayleigh scattering effect, explaining why the sky is blue when we look at it. When this happens, a doctor will dissolve the filler underneath the eye to get rid of the blue appearing product. The same enzyme, hyaluronidase, can also dissolve most of the complications that can occur from hyaluronic acid fillers, which is rather reassuring. This could be asymmetry, some nodule formation or accidental injection into blood vessels. Although hyaluronic acid fillers are the safest type of fillers, some of these rare complications could arise. More in inexperienced or ‘unregistered’ hands, but it could also sometimes happen in experienced hands. An experienced doctor will know how to manage these types of complications and how to dissolve the product correctly. Fortunately we do not yet have such a craze in our country for excess filler in lips or cheeks. In my practice, I have never had a request from a patient to dissolve filler because it was too much. The majority of requests after fillers are actually that they want more fillers. But should you feel that yours are too much, then it is a rather easy procedure to reverse it (if the filler was in fact hyaluronic acid, that is). Hyaluronidase is a safer product than originally thought. Adverse reactions to hyaluronidase are uncommon, and when reported they are most frequently local injection-site reactions (such as mild redness). Reports of more severe allergies to the product are believed to be very rare (<0.1%). When it comes to botulinum toxin injectables, it is a good news, bad news scenario. Bad news is this treatment cannot be reversed – BUT the good news is that the result is not permanent as it wears off within three to six months. Additionally, requests for reversing these treatments are rare, because any unwanted effects or unwanted appearances can easily be managed by a trained doctor. 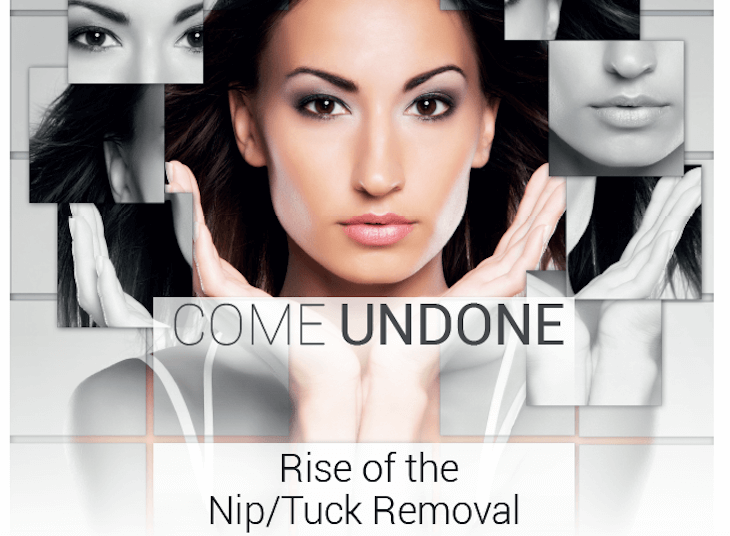 Unsurprisingly, very few people ask to have their threads removed because they want their au naturel look back (in other words, they preferred the look of their sagging face over their lifted face). Rather, any removal requests in this procedure usually stemmed from the previous, more permanet threads of yesteryear – as these old types of threads could cause problems such as infection. Thankfully, this has become a rare complication due to new technology material (the new thread lifting procedures uses dissolvable material to obtain a lift), as well as improved skills and training. Before opting to go for procedure removal, you will first need to really investigate your real reason for wanting it reversed. A doctor consultation will give you an opportunity to discuss the actual facts and whether it is needed or not, as well as the potential risks of this. Also, you should think twice if your motivation is due to celebrity trends, as these are most often not the real facts. Celebrity aesthetic stories have very little truth to them. 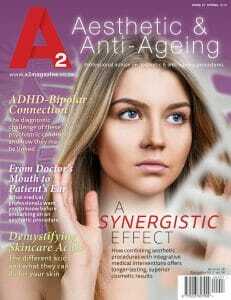 This article was written by Dr Riekie Smit and edited by the A2 team EXCLUSIVELY for the A2 Aesthetic & Anti-Ageing Magazine Spring / September 2018 Edition (Issue 27). Dr Riekie Smit (MBChB, MSc Sports Med) - Art, aesthetic medicine and science are her passions. Dr Smit is both a lecturer and trainer for local and international congresses and courses and is the honorary secretary of AAMSSA (the Aesthetic & Anti-Ageing Medicine Society of South Africa). Additionally, she is a faculty member of the American Academy of Aesthetic Medicine, and her greatest interest is in treating facial ageing, skin ageing and sun damage. 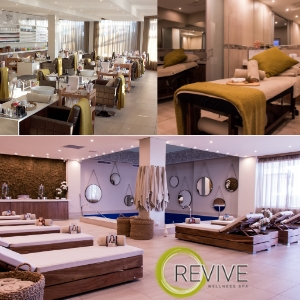 Dr Smit is also an advisor and part of numerous research and development teams, products and treatments.